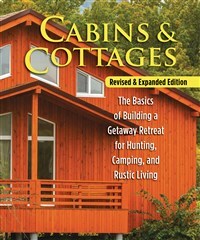 If you've ever dreamed about building your own rustic cottage in the woods or the hunting cabin of your dreams, or even homesteading off-the-grid, this handy reference provides a logical, sensible, and easy-to-follow approach to building a permanent shelter in that perfect out-of-the-way place. John Kelsey is a journalist and editor specializing in woodworking and furniture making. He has a degree in woodworking and furniture design from the School for American Craft at the Rochester Institute of Technology. He is a former editor in chief of Fine Woodworking magazine and a publisher of woodworking and home building books at the Taunton Press. He is the author of Furniture Projects for the Deck and Lawn. He lives in Newtown, Connecticut.